Chet Yorton made a speech in 1975 at the first bodybuilding competition that performed testing for steroid use. Of natural bodybuilders, he said, 'See friends, these are the real champions'. 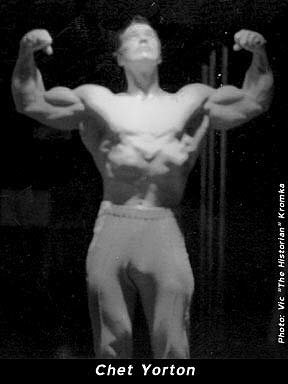 Chet Yorton made a speech in 1975 at the first bodybuilding competition that performed testing for steroid use. Of natural bodybuilders, he said, "See friends, these are the real champions". Chet Yorton was born in 1940. He was involved in an auto accident just out of high school that cut his left eye through the eyeball, cut his left forearm from his elbow to his wrist, dislocated his hips, and shattered the bones in his thighs. His leg injuries were so bad that doctors at the hospital debated about amputating his right leg, only he wouldn&apos;t consent. Chet Yorton&apos;s victory at the 1966 NABBA Amateur Mr. Universe contest was one of three ever occasions where someone would place above Arnold Schwarzenegger. This is perhaps what Chet Yorton is best known for, which is unfortunate, because he had a great impact on the sport of bodybuilding. In 1964, just 4 years after starting to lift weights, Yorton first became aware of steroids. It was in a gym when a top bodybuilder introduced them to members. Yorton was tempted until he talked to a doctor and was told of the side effects that could result like acne, gynecomastia (formation of breasts), impotence, hair loss, headaches, increased risk of heart disease, stunted growth if used at too early of an age, kidney problems, liver problems, and high blood pressure. Yorton started speaking out against steroid use immediately afterwards. In 1975 Yorton launched the NBA, which stood for Natural Bodybuilder&apos;s Association, the first federation to test for drug use at all of its competitions. 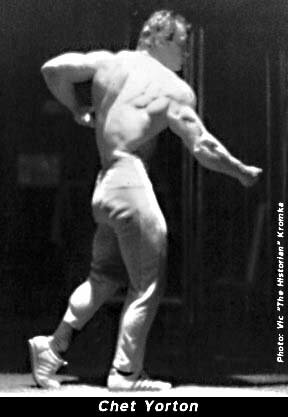 In 1981, he started a publication titled Natural Bodybuilding. The magazine provided exposure to bodybuilders who didn&apos;t use steroids, and also served to educate the public about the dangers of steroid use. 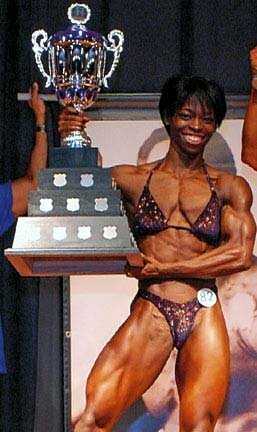 Currently (2005), bodybuilders from non-tested events are the ones that most people know of, because they are the ones featured in magazines on the grocery store&apos;s magazine racks, and they are the ones typically featured in the supplement company&apos;s ads. I hear kids talking about &apos;juice&apos; and using drugs, it prompted me to write this article. Let&apos;s get to the meat of the issue. Kids and juice. Let&apos;s look at some down-to-earth philosophical issues as well as some research. To reach the level of getting mass media exposure and landing endorsement deals, or winning the most well known bodybuilding title today, the Mr. Olympia, one must use steroids, growth hormone and other illegal and dangerous drugs. Basically, they must break the law and risk their health to try to get a little bit of fame and fortune. Should this be what the media promotes? Should this be what the supplement companies seek out to offer endorsement deals to? 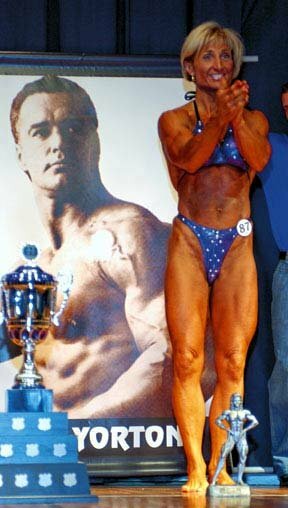 Should this type of activity be rewarded with top placements from bodybuilding federations? Accepting Natural Bodybuilding As A Legitimate Sport. It never seems to amaze me how people can so quickly judge one another. How can we expect other sporting bodies, plus the general public, to take natural bodybuilding seriously when the majority of us don&apos;t? After all, shouldn&apos;t the athletes who don&apos;t compromise their health, or break the law be the real role models? Aren&apos;t they... as Chet Yorton himself said at that first drug-tested competition in 1975, "the real champions"? Each year the championship will award identical trophy cups. And each year&apos;s winner will be engraved on one of the awards plaques so subsequent awards contain a historical record of all its previous recipients. The 2005 Yorton Cup&apos;s will be awarded November 12th in Miami, FL. Details on the event can be found online at www.theOCBwebsite.com. Matt Shepley is a natural bodybuilder, photographer, and bodybuilding/fitness contest promoter. He can be contacted via email, by visiting his federation&apos;s (OCB - Organization of Competitive Bodybuilders) website for steroid-free bodybuilding, fitness and figure competition in the United States (www.theOCBwebsite.com), or by visiting the website for his magazine, which covers steroid-free physique competition in North America (www.FitnessandPhysiqueMag.com).